I’ve been doing a Christmas cover illustration for editor Eric Meisfjord and the Inland Register for quite a few years now. I always look forward to it. The Inland Register is the monthly news magazine for the Roman Catholic Diocese of Spokane, Washington, USA. My original concept did not include Saint Francis. That was Mr. Meisfjord’s suggestion, and it was an inspiration for a couple of reasons. Saint Francis of Assisi is one of the most beloved Catholic saints. Rich kid, wild youth, dramatic conversion, a life of humility, simplicity, poverty, and personal holiness. It’s a story that gets your attention. 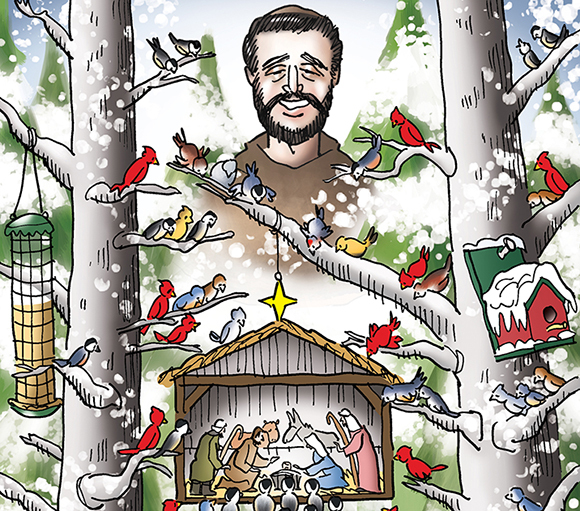 There are many stories and legends about Saint Francis, including his preaching to the birds and other animals. He is very much identified with a love of nature and all creation. very diverse “flock” (I regret to say I’ve been unable to discover who did this wonderful illustration); right: a St. Francis statue (many people have one in their garden). Here’s a detail image with my own take on St. Francis. I definitely see him with a smile on his face. I said including St. Francis here was an inspiration for a couple of reasons. OK, he has an association with birds– what’s the second reason? 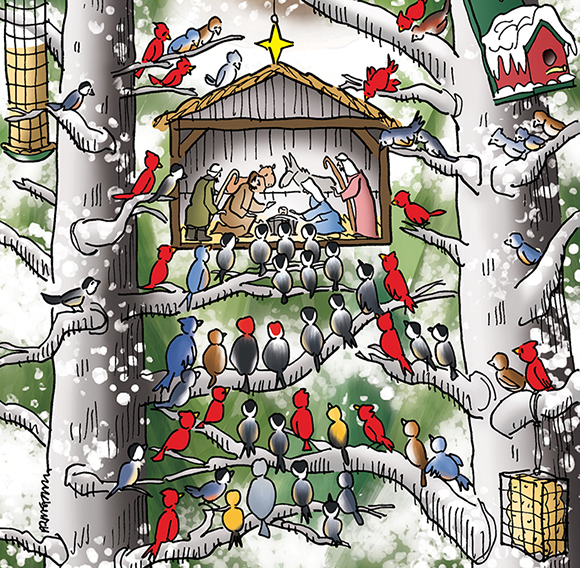 He created the very first Christmas creche in 1223, using live animals. A creche, also known as a Nativity scene, is a three-dimensional representation of Christ’s birth in Bethlehem. The concept became enormously popular, and remains so to this day. Key figures include Mary, Joseph, the Baby Jesus, shepherds, animals, and the Magi. Naturally, at this point, the big question on everybody’s mind is: What’s the total number of birds in the illustration? I count 76. Most of them are cardinals and black-capped chickadees. What do you think? Are you familiar with St. Francis? Is a creche part of your Christmas? Have you ever hung one in a tree?? Hope you’ll leave a comment. Did The Animals Really Talk On Christmas Eve? No, They Jammed! Put On Your Cowl, It’s Time To Howl– Hallelujah! Oh, this is lovely! Such a sweet, peaceful, and fascinating image! LOVE the idea and how you brought all of it to life! And it’s great to see a saint smiling! So often they’re in the throes of torment, or something. Your St. Francis looks joyful. And there’s not one drummer drumming, anywhere in sight! I have to believe that saintliness and smiles go together. Too often people fear humor because they equate it with frivolity and a lack of seriousness. Not so. Faith is confident and naturally joyful. G.K. Chesterton once opined that angels can fly because they take themselves lightly– a great insight! Thanks as ever, Robin, for your smiles and joyful support– Merry Christmas!! I’m singing…. “And a partridge in a pear tree.” And I’m smiling from ear to ear..! 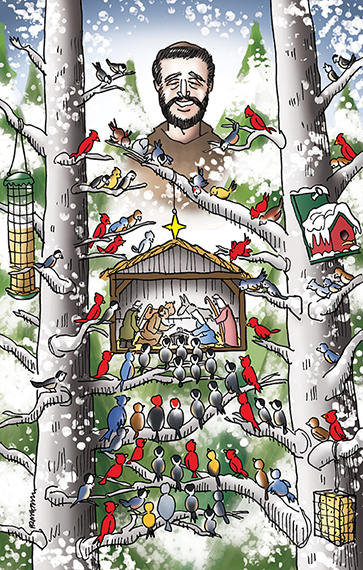 A wonderful image, Mark, filled with love and joy… Well done to you..
St. Francis is one of my favorites. His love of animals did draw me to him. I love the smile you gave him. I have an illustration of Jesus laughing. I’d like to think they also laughed, that they also enjoyed their lives despite the challenges. Thanks, Judy. I’ve seen that illustration of Jesus laughing. I have to believe he and Saint Francis smiled and laughed a lot despite the tremendous challenges they faced. Sadness and gloom sap one’s strength; joy and laughter revive it, and help us press on with confidence. He clearly had a very impressive understanding of human psychology. Thanks, Mark. I’ve never heard those lovely quotes before. They are inspiring and provide a lot of comfort. Ahh so Christmasy! I love this Mark! And I really adore the details in your illustration. I love birds–I had a lovely blue parakeet named Holly when I was younger. I’m going to pretend that one of your adorable birds is actually Holly if that is okay with you 😉 teehee! 76! There really are 76 birds!!! great composition! Funny thing: the first three times I counted them, I got three different totals! I finally had to hunt up my original line drawing and tick them off one by one. When I got 76 three times in a row, I figured I had a winner! Oooh, Spokane again. Well, you know my connection to the city, but I can’t remember if you told me yours? Beautiful, beautiful illustration! I really do think this is my favorite to date. I hope you can visit someday. It’s sleepy, and a little rundown, but I’ve always, always enjoyed my time there. I also posted this on my Facebook page. Thanks again, Mark, for all your good cheer. Hey, don’t feel bad. As I mentioned in another comment reply, I kept getting different bird totals myself until I physically checked them off one by one on my original hand-drawn line art. Omg yes! Or chocolate…….oh…or a chocolate cheesecake….waaah! 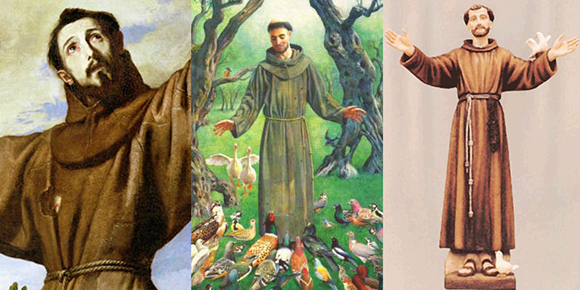 No, I didn’t realize that St. Francis was a nature lover and saint to represent man’s love for nature/animals. It would be lovely if one day we will have an English language Christmas carol or song that becomes popular with birdsong in the background. Warm wishes for a Christmas ..with real bird twitters (not just the Internet social stuff). There is a Carol Of The Birds, but I’ve never heard a version that employed actual birdsong– that’s a very intriguing idea! Francis would certainly be happy! Happy Christmas to you too, Mark!!!! I had to count for myself…and WOW 76 indeed! Awesome attention to color and detail, love this illustration. Really appreciate your kind comment, Dave. Thanks much, and a very Merry Christmas to you! Yes, it’s funny about the creche. Most people would probably guess it’s a fairly recent idea, dreamed up by someone to make money off of Christmas. Pretty amazing to think it goes all the way back to 1223, to a friar who wanted to make Christ’s birth more meaningful to people. I’m a Catholic myself, and I appreciate the creche’s power to inspire devotion and contemplation, and to help keep the focus on the sacred origins of Christmas Day. Thanks, Linda, that means a lot. Yes, Francis’ observations have great power, don’t they? He clearly had great insight into human nature. One hates to think of all the good ideas and hard work that are wasted every day because human nature and psychology are ignored. If people won’t “buy in” to your ideas, it doesn’t matter how brilliant they are– you’re a goner.